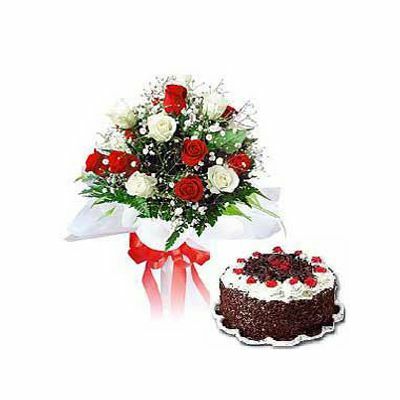 This hamper consists of 24 red and white roses bunch and a delicios black forest cake.Our Bright and Colorful is a brilliant combination of lovely red and white roses bouquet and a fresh cake. 24 fresh and fragrant red and white roses are stylishly combined in a bouquet by our professional florist. Fillers and greenery ha been added to the bouquet to make it more attractive. Both white and red roses represent your soft feelings quite gracefully. Send roses bouquet online and let them express your feelings. 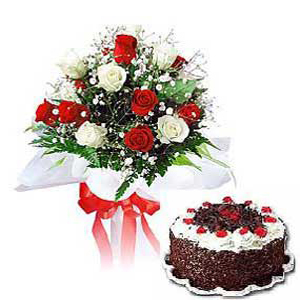 You can send flowers and the rich delicious cake to your dear ones to show how much they are thought of.